The long-running joke about Batman was that—where guys like Superman have multiple superhuman abilities—his only real superpower is money. Now, he's apparently going to have less of it. And it might be one of the more interesting things to happen to the Dark Knight in years. There's a status quo shift happening in DC Comics' books right now, one that's seen the complete destruction of Arkham Asylum and the ascendance of Catwoman as the new crime boss uniting all of Gotham's crime families. But, for me, the biggest game-changer is having Bruce Wayne get booted from his family home and apparently having less cash to blow on various Bat-things. Those plot points come up in the first issue of Arkham Manor, a new series out this week by Gerry Duggan and Shawn Crystal that spins out of events happening in the year-long Batman: Eternal maxi-series. What I like about this debut chapter is how it explores Batman's personal attachment to the giant house above the Batcave. It's a sprawling memorial to the parents he lost and, more poignantly, where he must have grieved long before he started training to become a creature of the night. Batman's operated away from Wayne Manor before but the move to a skyscraper in the 1970s comics was written as his own decision. Here? Not so much. 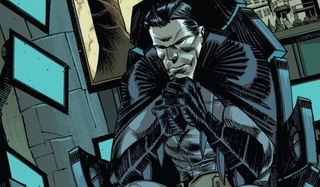 Bruce Wayne justifies letting the city put all of his psycho archenemies in the place he grew up as a good thing in the pasges of Arkham Manor #1 but he's not happy about it. Not much follow-up is given to the line about Bruce having lost the family fortune, but the sequence where he's harassed going into his apartment points at interesting story potential moving forward. When Batman beats up a street thug or henchman, he could be putting a hurting on a normal person driven to crime by horrible circumstances. It's always been a touchy line of critique that observes that Batman is a rich guy beating up poor people. A smattering of stories have tried to touch on the incongruity and unfairness of this dynamic but what this change in circumstance gives Bat-creators is a chance to go at the class divide in Gotham in a sustained way. It also opens up a fresher vector for writers and artists to humanize Batman. He seems a lot less unknowable and relatable when he doesn't sleep in a big ol' house. Crystal's art goes a long way to making Batman feel more like a real person. His energetically scratchy linework renders a Batman with more human-sized proportions and the art on display here seems to thrive in showing the imperfections of the people, places and things that the Dark Knight touches. Will Batman ever need to take a payday loan to fill up the Batmobile? Probably not. But this moment is a chance to bring down the modern-day 'BatGod' iteration of the character, so called because he's often presented as near-omniscient and almost infallible.